Kitterman Woods Residents is your dog constantly licking and scratching? If so, you’re not alone. Many dogs lick and scratch as result of itching (also called pruritis). The itching may be minimal or extreme and can even cause injury. Itching is a characteristic of many possible skin conditions and treating an itch effectively requires determining the underlying cause. This is not a road you want to go down alone. Finding the cause of an itch requires testing and help from your veterinarian. It is important to remember that itching is not a disease or a cause of disease, but rather the result of a disease process. Effectively treating itching requires treating its cause. 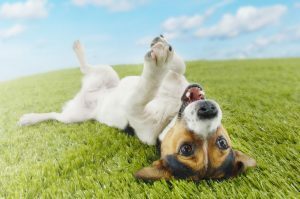 If your dog is frequently itchy, you may first suspect a problem with fleas. It’s a common assumption, but fleas are far from the only cause of skin irritations and itches. That said, your dog should absolutely be on year-round flea and tick preventative.